For all the skepticism and questions surrounding the Canucks top-six forwards, like if the Sedin twins are still elite performers, whether Alex Burrows or Radim Vrbata is the right guy for first line duty or if Bo Horvat or Brandon Sutter will lock up the second line position, the collection of bottom six forwards have an interesting dynamic to them. The offseason acquisition of Brandon Prust and the resigning of 24-year-old Linden Vey to $1 million one-way contract essentially locked up the bottom six. But the questions that remains is whether or not there is room for another prospect to work his way into the lineup. Logically these lines make sense. Each unit is centered by a young and inexperienced player but flanked by seasoned veterans. If the goal is to develop the Canucks young centers at a slow and steady pace, this is definitely the way to do it. Where Do Rookies Ronalds Kenins and Jake Virtanen Fit Into the Mix? While Vancouver armchair GM’s have had Jake Virtanen and Ronalds Kenins penciled into the starting twelve forwards since the day the Canucks were ousted from the 2015 Playoffs, the reality is that if the Canucks want to remain at all competitive in one of the toughest divisions in the league, they will need to maintain a comfortable mix of veteran and youth presence in their lineup. The addition of Prust essentially pushed Ronalds Kenins into the 13th spot and while Jake Virtanen clearly possesses more potential than Kenins, the truth of the matter is that Kenins should take precedent over Virtanen, at least this year. 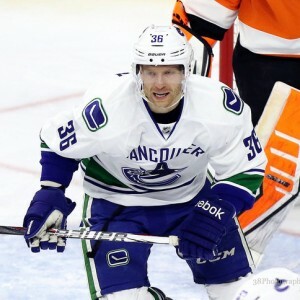 Kenins suited up for 30 games with the Canucks last year and was good for 12 points while recording two points in his five playoff appearances. He struggled with consistency which was the primary reason he was in and out of the lineup for the second half of the year but he showed potential to be a truly effective bottom-six forward with serious scoring ability. 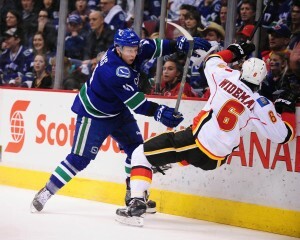 He also seemed to have seamless chemistry with Canucks prized jewel Bo Horvat. Virtanen on the other hand has struggled physically and mentally through the Young Stars tournament and training camp. While he has displayed his obvious tantalizing skill level and no-fear mentality (a.k.a. a head turning, crunching hit on Edmonton’s future star Connor McDavid), Virtanen has been a target for opposing players and it seems that he hasn’t yet learned how to deal with that in an effective manner. He scored just once in the Young Stars tournament and will have at least two NHL pre-season opportunities to show whether or not he should be given more slack. More importantly, Virtanen isn’t a bottom six forward. He would be completely out of his realm playing with the Canucks bottom-six forwards this year in a big and tough Pacific Division. Virtanen has size and strength, and without a doubt can protect himself while playing the puck, but if asked to battle in the corner with say, Los Angeles’ Milan Lucic, Virtanen would be embarrassingly outmatched. An experience like that might just taint the promising young forward’s development. Meanwhile Kenins displayed a natural tendency for situations like that and would make a virtually interchangeable option should any of the Canucks bottom-six wingers get injured. Are Higgins and Hansen the Right Match for Bo? Bo Horvat was a shoe-in as the Canucks second line center for 2015-16… that is before the Canucks went out and traded for center Brandon Sutter, subsequently signed him to a five year extension that pays him $4.375 million a year, and subtly told the hockey world that Sutter had a shot at their second line center position. If Sutter confirms his spot quarterbacking the second line (which it is likely he will, at least to start out the year), Horvat has a one hundred percent guarantee on the third line center position where he will earn more ice time than last year and be flanked by veteran Canucks forwards Chris Higgins and Jannik Hansen. In 2014-15, Higgins and Hansen combined for 28 goals and 69 points. Both players are on matching contracts, the only difference being that Higgins contract runs out after the 2016-17 season while Hansen is signed through the 17-18 year. At $2.5 million per player they aren’t cheap third liners by any means, but what they offer is invaluable experience for a budding and rising Bo Horvat. The two were integral pieces of the Canucks glory seasons that saw two consecutive President’s Trophies and a 2011 Stanley Cup Final Appearance. Both players experienced the devastating 2013-14 season under one year coach John Tortorella and like most long time Canucks, both players are soundly invested in Vancouver as their franchise. Their production has varied and it seems Higgins might be on the slow decline of his career but Jannik Hansen’s play has been some of his best and he might be in the very peak of his career. Both of the players are hardworking two-way guys. Something that will be beneficial for Horvat to watch and learn from as he accepts bigger and bigger roles with the team. On the fourth line will be Brandon Prust and Derek Dorsett – assumingly centered by Linden Vey – and they will give the Canucks a traditional rough and tough fourth line (with some quiet skill from Dorsett and Vey). 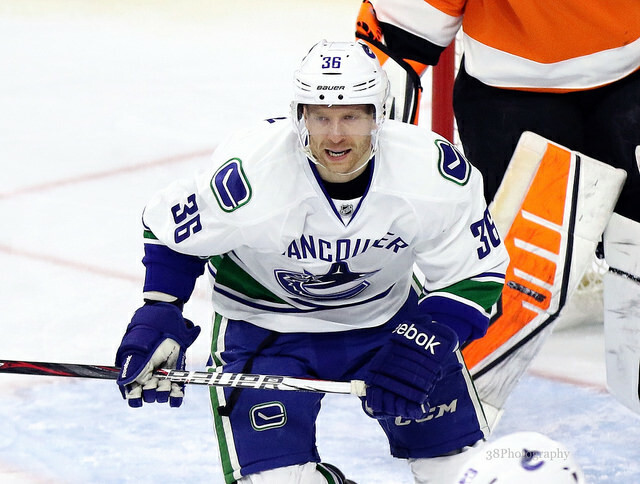 The 24-year-old Ronalds Kenins, who signed a one-year one-way deal in the 2015 offseason will be a luxurious option as a 13th forward and should someone like Sven Baertschi or Brandon Prust underwhelm the coaching staff, don’t be surprised if Kenins proves he is worth a lot more than he gets credited for.